Vintage Imagery just started its own unique Referral Program that offers some great discounts and incentives to both the person who has been referred and the person who did the referring . Details below! If you have referred someone to Vintage Imagery you will receive $100 off of your next session. If you have been referred to Vintage Imagery from a client who has shot with us before, you will receive a $100 discount off your entire package. 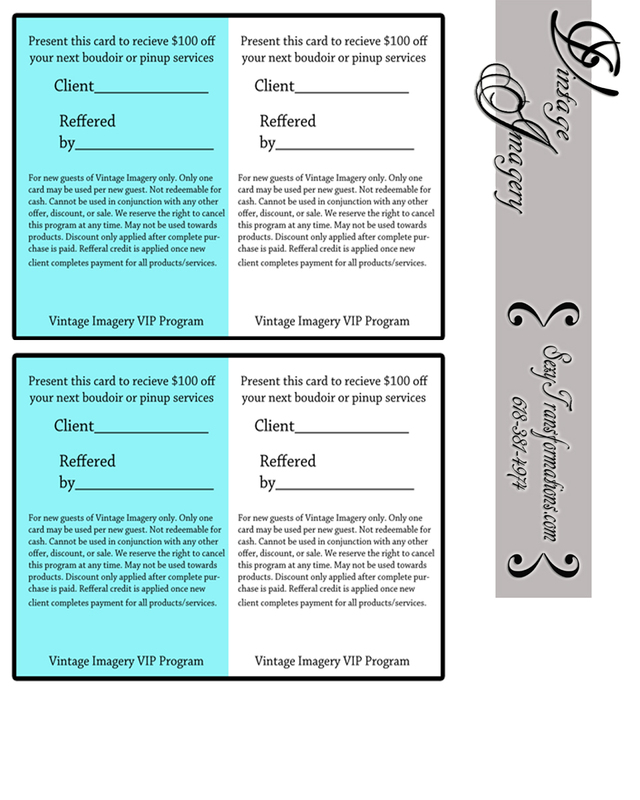 Click the VIP.JPG below and print out your referral cards, sign your name as the referrer and hand them out as gifts to your girlfriends, family members, or co workers and they will receive $100 off their shoot with us. For each client that turns in one of your cards and books a shoot you receive $100.00 towards your next session. Payment for products and services must be received in full before referral credit is applied. Clients must be first time customers of Vintage Imagery. Only one reward card per new client. $100 cards are good towards any full priced session. Cannot be combined with any other offer. Signed Referral cards must be presented at time of shoot. Cards have no cash value and may not be used to purchase products. You, as the referrer, must sign your name to all Reward Cards you hand out. You will receive credit for each signed Reward Card turned in by a new customer who books a shoot with us, once all purchases are paid for. There is no limit to the number of Reward Cards you can collect. Referral credits for the referee are valid for one (1) year after referred clients appointment date. Credit for the referee can be combined toward the session fee or collection of their choice. Offer not valid on discounted shoots or specials. Cannot be combined with any other offers. Not valid on product purchases or past sessions.